If you simply measure your productivity at work in terms of how many hours you spend behind your desk, you are likely to be disappointed with the results. Sitting at your desk is no guarantee of production, as you actually have to be focused and on task during those hours if you are going to see real progress. It is hard to be motivated to work day after day, which is why so many people turn to time management techniques to stay on task. One popular option is the Pomodoro Technique. By using this technique, you will have built in short breaks and your overall day should be more productive as a whole. As you may know, pomodoro is the Italian word for tomato. Inspired by a kitchen timer which was shaped like a tomato, this technique encourages users to work in 25-minute segments. When the 25-minute segment has expired, you are to take a five-minute break before getting back to work. Once you have gone through four cycles of working for 25 minutes at a time, you then take a longer break before getting back to the tasks at hand. This is likely more breaks than you take during your current work day, but adding breaks may actually be just what you need to improve your productivity. 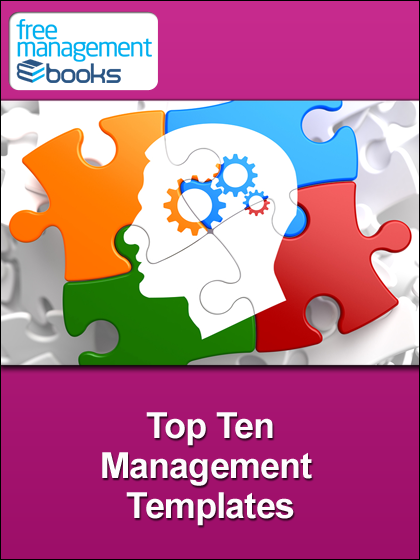 No one has the capability to focus on a single task for an indefinite period of time. Humans need breaks from any task which they are completing, no matter how important it may be. With that in mind, the Pomodoro Technique can help you to build in much-needed breaks to the course of your day. Without a technique such as this, you might wind up stuck at your desk all day long – with decreasing productivity as the hours go by. Step away for a few minutes after each work segment and you should return to your work refreshed and ready to go. If you would like to put the Pomodoro Technique into action during your own work day, follow the process outlined below. You need to make sure that your scheduling for the day matches up with any out-of-the-office obligations you have lined up. So, when you first arrive at the office for the day, take a look at your schedule as a whole and think about how you can build in the Pomodoro Technique to your day. If you are going to be in a meeting in the afternoon, for example, you may wish to line up your morning with a series of 25-minute work sessions. Make sure your plan works for the day in front of you and it should be easy to stay on track. In addition to scheduling your work periods, you also want to schedule out your breaks as well. Are you going to take just a five-minute break between each session, or are you going to take a longer break at some point? It is good to take at least one 30-minute break in the day to have some food, relax, and just get away from a mental standpoint. To make sure you hit the 25-minute mark during each of your work sessions, find a timer that you can use over and over again. For most people, the easiest option is going to be an application for your phone. There are many timers available for both iPhone and Android devices, so download one that you like and learn how to use it. Now, setting a 25-minute timer will just be a tap away. Once the timer starts, you are going to be working on only the task you have scheduled for that session. Don’t keep your email open on the side of your screen, and don’t check your phone incessantly. If you do need to be available, make sure your phone ringer is on and someone will be able to reach you if necessary. Work hard on the task at hand for the entire 25 minutes and you will be surprised with how much you can accomplish in such a short period of time. 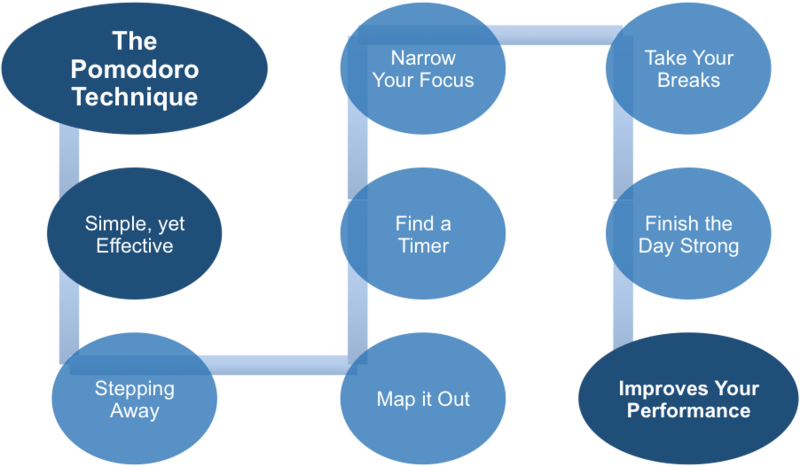 By focusing on just one task rather than several at the same time, your productivity will skyrocket. 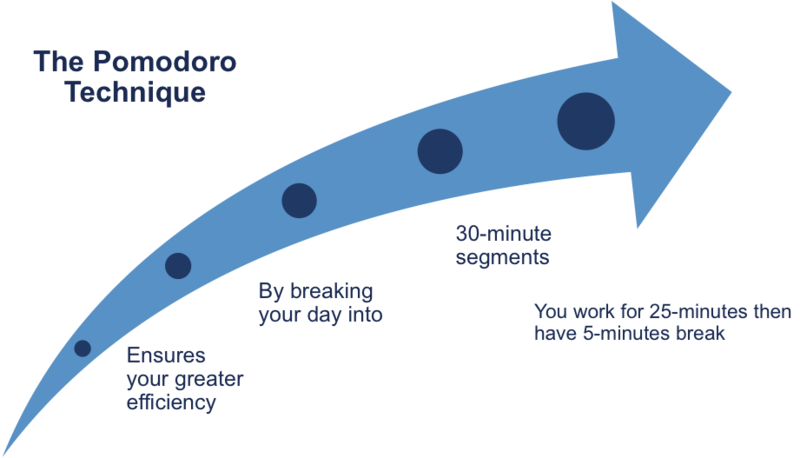 As an added benefit of using the Pomodoro Technique, you may notice that your stress levels begin to decline. The hectic way in which many people go about work can lead to feelings of stress because you will constantly feel like you are scrambling to get things done. That won’t be the case when you use this system. Instead of being frazzled at the end of the day, you should wind up feeling content and satisfied with what you have accomplished. 25 minutes might not be a long time, but you can get plenty of work done as long as you are focused. Just as you need to be diligent about remaining focused during your work sessions, you also need to be serious about your breaks. When you arrive at a five-minute break window, take your mind off of work and do something else. Check messages on your phone, play a quick game, or just let your mind wander. If possible, it might be nice to walk outside for a couple minutes of fresh air. Whatever it is, find something that can help you to clear your mind before going back for more. As the day wears on, you might be tempted to give up on your timer and just keep working until everything is complete. Don’t fall into that trap. Often, the biggest difference between an average day and a highly productive one is how you finish. Work hard through your final pomodoro period of the day and you will be satisfied with your effort. 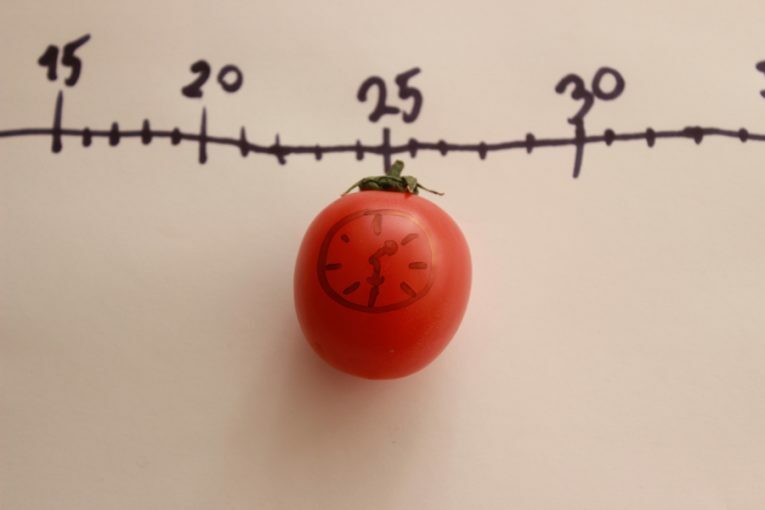 The Pomodoro Technique is about as simple as it gets, yet it can be highly effective. 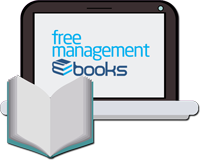 Practice scheduling your day with 25-minute sessions and short breaks throughout, and you will see your performance in the office quickly improve.